If the goods are faulty we will meet our obligations under the Consumer Guarantees Act to provide a remedy. If you change your mind about a product some products can be exchanged or returned for a full refund within 30 days of purchase provided the goods are returned in the original packaging and condition. Testpots, tinted paints, wallpaper or accessories ordered on indent and custom-made curtains cannot be exchanged or returned for a full refund unless there is a product fault so please choose carefully. Indent items are those ordered in especially for your order that are not normally held as shop stock. 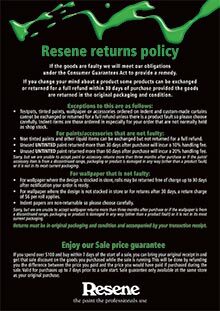 Non tinted paints and other liquid items can be exchanged but not returned for a full refund. Unused UNTINTED paint returned more than 30 days after purchase will incur a 10% handling fee. Unused UNTINTED paint returned more than 60 days after purchase will incur a 20% handling fee. Sorry, but we are unable to accept paint or accessory returns more than three months after purchase or if the paint/ accessory item is from a discontinued range, packaging or product is damaged in any way (other than a product fault) or it is not in its most current packaging. For wallpaper where the design is stocked in store, rolls may be returned free of charge up to 30 days after notification your order is ready. For wallpaper where the design is not stocked in store or for returns after 30 days, a return charge of $6 per roll applies. Indent papers are non-returnable so please choose carefully. Sorry, but we are unable to accept wallpaper returns more than three months after purchase or if the wallpaper is from a discontinued range, packaging or product is damaged in any way (other than a product fault) or it is not in its most current packaging. Returns must be in original packaging and condition and accompanied by your transaction receipt. If you spend over $100 and buy within 7 days of the start of a sale, you can bring your original receipt in and get that sale discount on the goods you purchased while the sale is running. This will be done by refunding you the difference between the price you paid and the price you would have paid if purchased during the sale. Valid for purchases up to 7 days prior to a sale start. Sale guarantee only available at the same store as your original purchase.